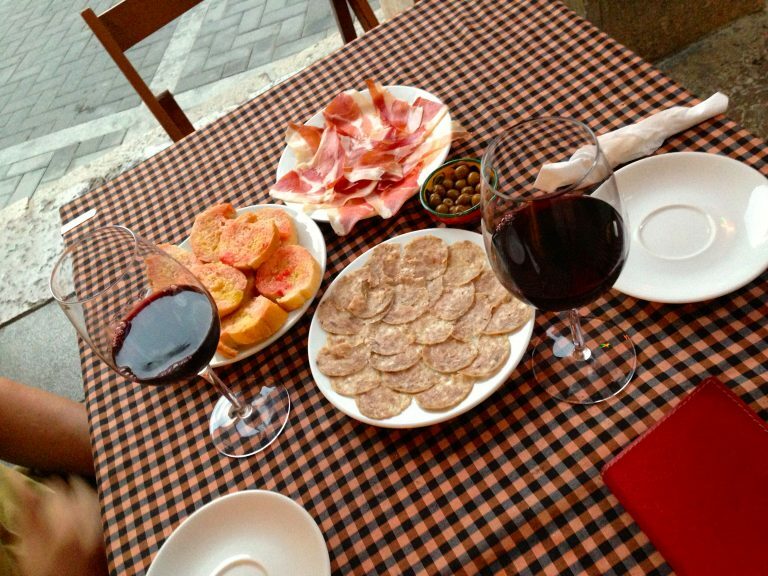 Ready for a little wine and tapas in Priorat? The European road trip continues in the rustic, picturesque mountains of El Priorat, Spain. 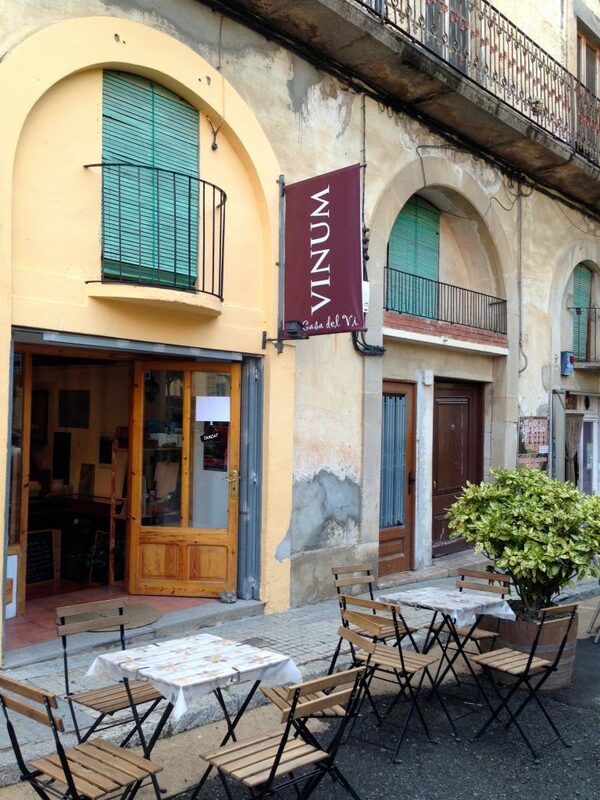 The uber rural destination is dense and spread out offering some great places for wine and tapas. Here, we did a little primary research (it’s a tough job, but you know)! 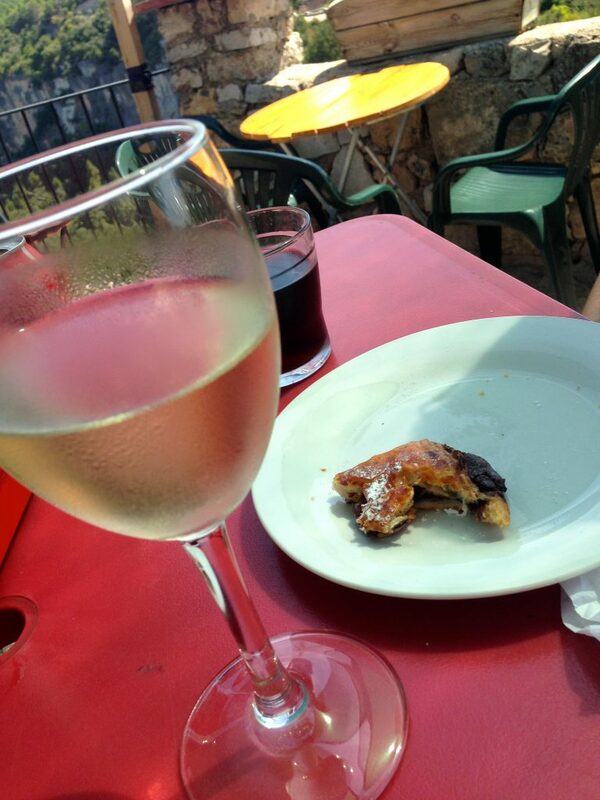 We found our favorite wine and tapas in Priorat at Calaix on our last night. The bar is in Falset, a larger city of the region. 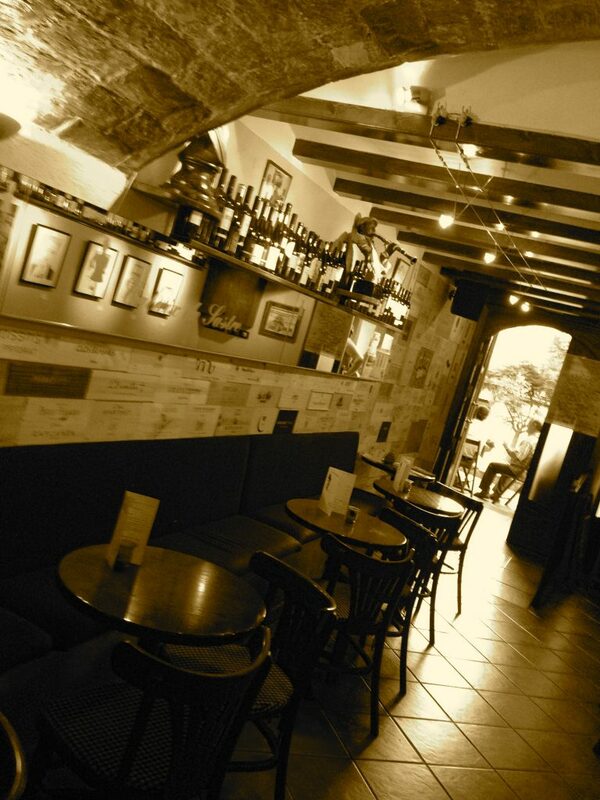 The tapas are fantastic, the wine list is everything you want to try in Catalan, and the atmosphere rocks. We sat outside watching the world go by, sipping wine, and gnoshing on foods. As far as wine and tapas in Priotat go, this is one place not to miss. Menu: Wine and Tapas. Address: Placa de la Quartera, 39, Falset – WiFi. Located in the teeny tiny village of Porrera, the enoteca serves regional white and red wines, primarily bottles from producers in the village. It’s located in the main square next to a little canal. 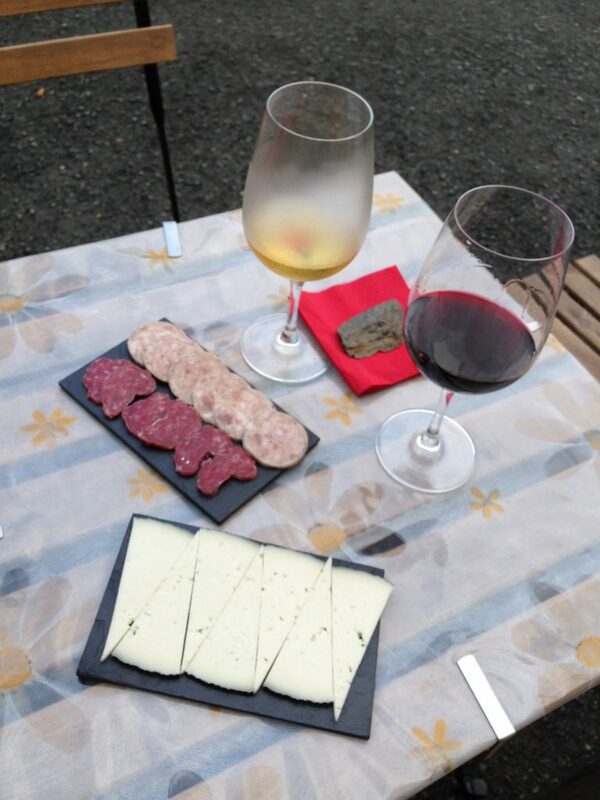 We tried a Grenache Gris (white), a Granache red, and a small plate of queso and two types of sausage. The Botifarra Blanca sausage rocks. A wine and tapas in Priorat must – it’s in the heart of a wine village that transports you back hundreds of years. What more do you need? Menu: Wine and Tapas Only. Address: Pl. Catalunya, 1, Porrera. In our quest for an oceanfront stop we ventured to Cambrils. Since it’s a tourist destination we kept our eyes peeled for a local watering hole. We found El Moll just off the waterfront, filled with locals watching soccer – ‘scuse me, football. It had a great wine list (three pages – local, regional, and all of Spain) and the portions were generous. 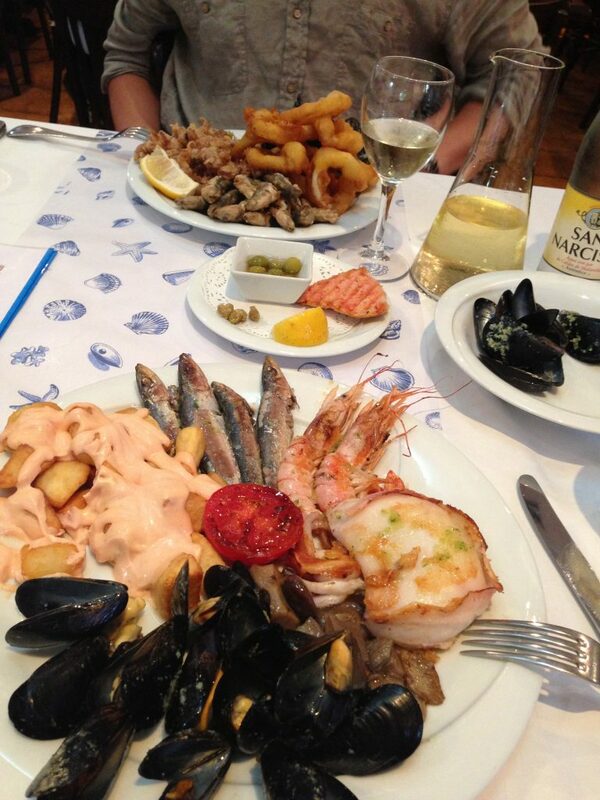 We selected two mixed plates of seafood tapas and a carafe of house wine. For €36 we couldn’t have done better – the wine was €4 for a carafe. The amazing food left us fat and happy. Menu: Wine and Tapas, Full Menu Address: Joan Sebastia Elcano 8, 43850, Cambrils. With a few hours between tastings we headed to the hilltop village of Siurana where we found Terrassa. They offer simple wines and a handful of traditional Catalan tapas, like gambas (prawns) and bravas (cubed potatoes in a spicy tomato sauce). The draw of Terrassa is easily the view. It sits atop the hill, almost seemingly carved into the stone. The views are incredible. Worth a stop. 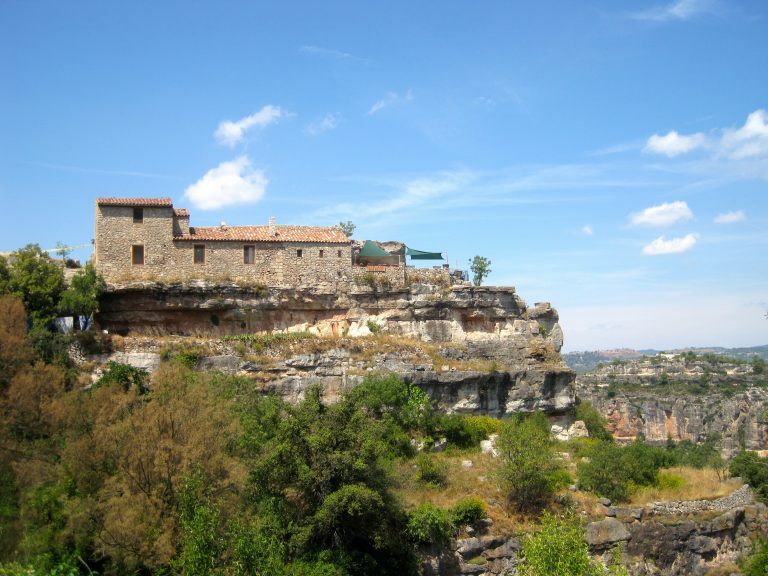 Address: You can’t miss it as you drive into Siurana. WiFi. Make your own wine and tapas spread. For a brilliant Do-It-Yourself experience hit one of the region’s many Cooperativ’s or enotecas (see deets below), find a perch with a breathtaking view, add wine, and serve. 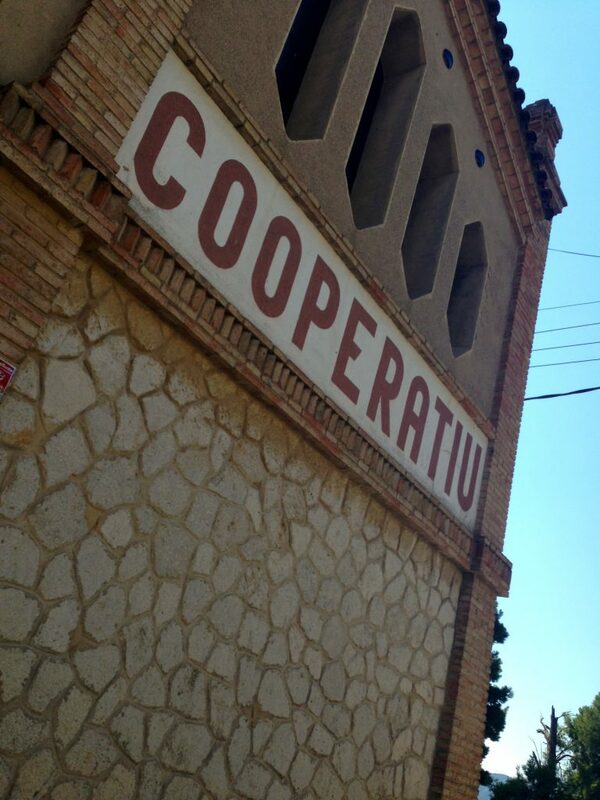 We stopped at the Cooperativ in Cornudella de Monstant for a quick wine tasting and shopping. 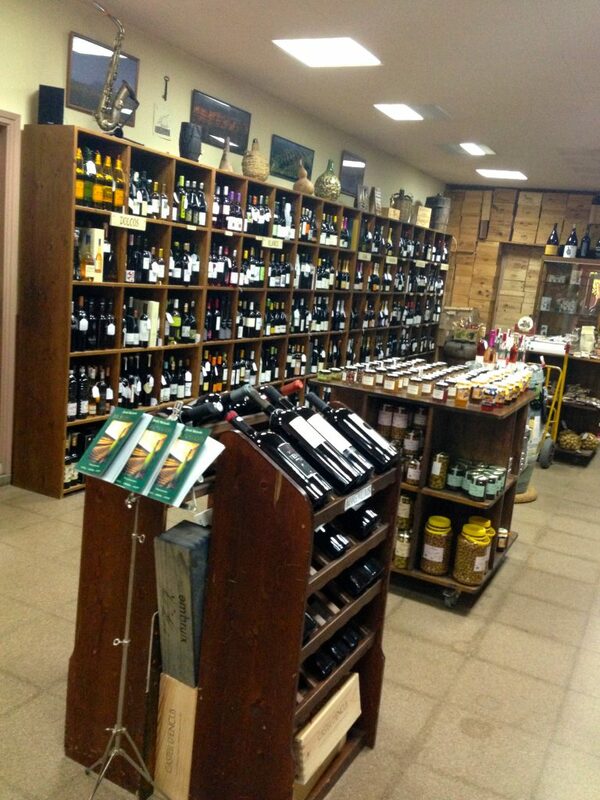 They offer regional wines, cheese, sausages, jams, olives, olive oils, biscuits, and a ton more. We got a little stash of goodies and did a tasting (no charge). Armed with all we needed, we made our way up for a cliffside picnic. A cheaper, more relaxed way to go – I mean, the views here are no joke. Highly recommend D-I-Y’ing wine and tapas in Priorat. Bonus: Enotecas in Priorat, Spain! When in wine country every good wino needs quality enotecas. 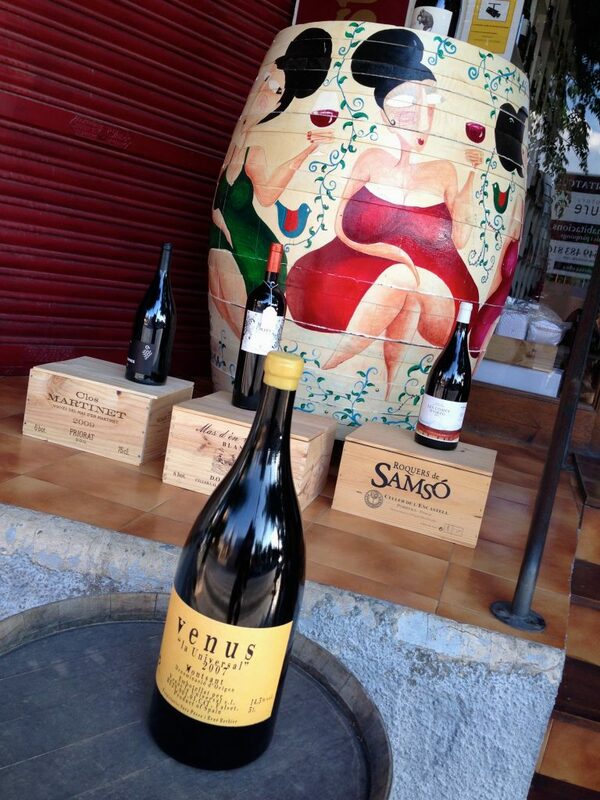 We found two in Falset – cause Girl’s Gotta Drink Espana wines at home in Piedmont! Aguilo Vinateria, Miquel Barcelo, 11 Falset. The place has been open for 50 years (same two brothers are the owners, natch). Great wines to buy and you will always find wines open to taste (compliments of the casa). We bought a quite a few bottles here. 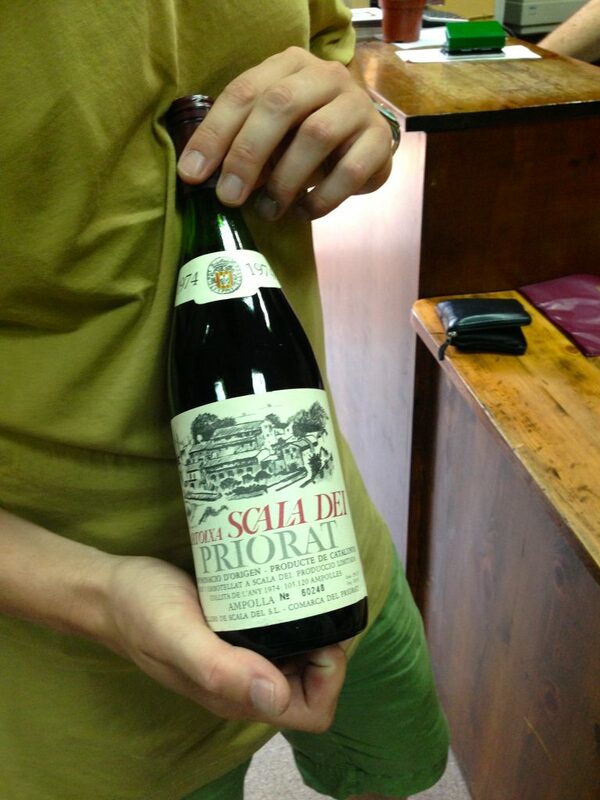 Most notably, Il Ragazzo’s new prize possession, a 1974 Scala Dei (apparently it’s considered the first ever bottled Priorat wine). Vin I Olis del Priorat, Miquel Barcelo, 25 Falset. 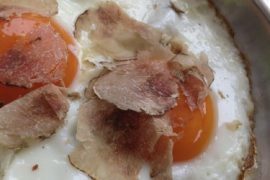 All of a block from Aguilo, this is another great enoteca with more than just wine. Find local cheeses, sausages, olive oils, and other regional specialties – like Granache beer (of course this Colorado girl and English boy are taking a bottle home)! 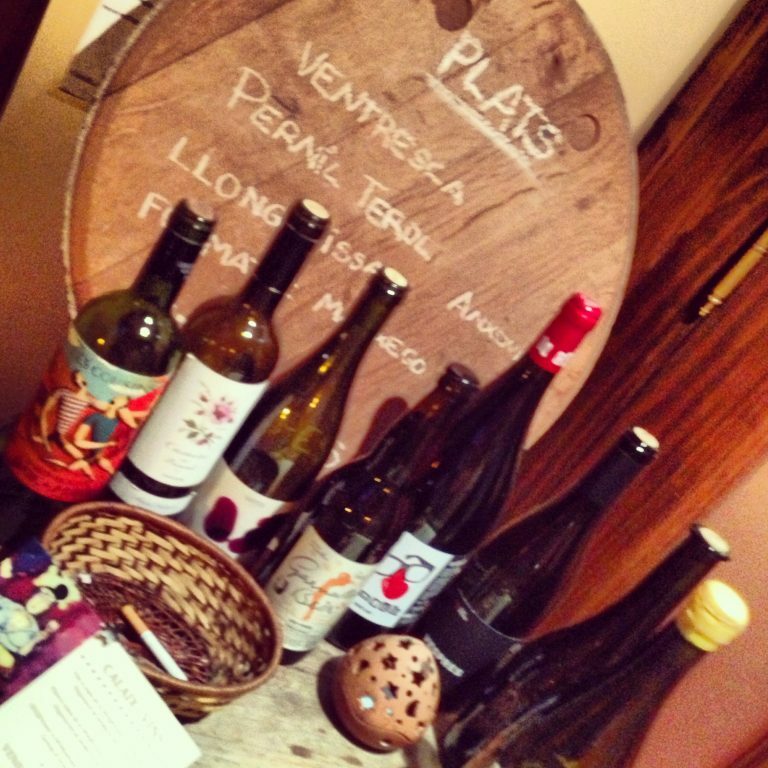 Got some tips on wine and tapas in Priorat? Lemme know – we plan to go back. Sitting on a plane looking forward to stale almonds and Turning Leaf wine. Wish I was in Espana with you! See you in a couple months, Mike! Safe travels and thanks for reading! Hi Valerie and Evan, Good to see you have been busy. There was a great atmosphere in the square the other evening in Falset. Sorry to bow out, but the two of you looked very cosy together! Looking forward to more posts about your trip to Priorat. Nice to have met you and hope to see you both here again soon! Ciao, Rachel! It was so wonderful to meet you and spend time exploring the wines together! 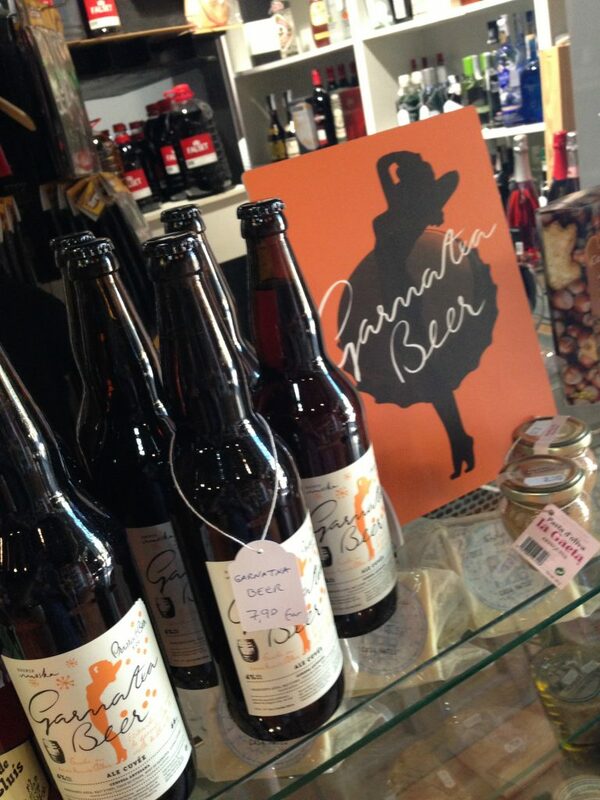 We look forward to a return in the next couple years – can’t wait to open more bottles with you! We fell in love with Falset that last night. I’ll be in touch this week. We just unloaded our wines and are admiring the spoils :). Please come visit us here, too! 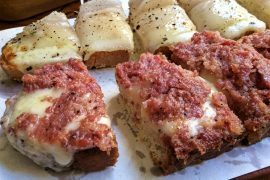 wow, I haven’t had my breakfast yet and now i’m craving some tapas and even something smooth to drink, looks like some wonderful places to try and enjoy the rest of the day…thanks for linking up today. Ciao, noel – grazie for reading (viewing!) The trip was amazing and I already miss tapas! and, I live in Italy – home of aperitivo! This would definitely be our prefered method of discovering Spain – through wine and cheese! Thank you for reading! Yes, we look forward to more wine and cheese adventures in Espana. Fantastic! Ciao! 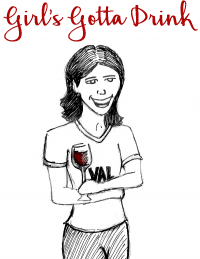 Ciao Valerie, ho appena scoperto il tuo blog. I am glad you discovered El Priorat. I also toured some of the towns and cellers around La Sierra de Monsant. As a wine lover, I will have to follow you from now on. Ciao, Eduardo! We loved the region and most certainly the wines! We look forward to a return one day. I tried to click thru to see your blog, but it wasn’t loading properly. I am excited to see your pictures. 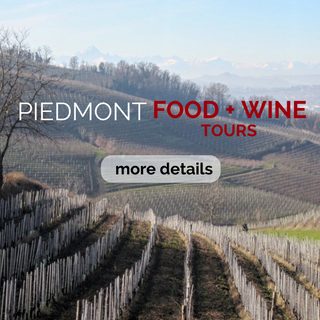 Let me know if you make it to Piemonte! 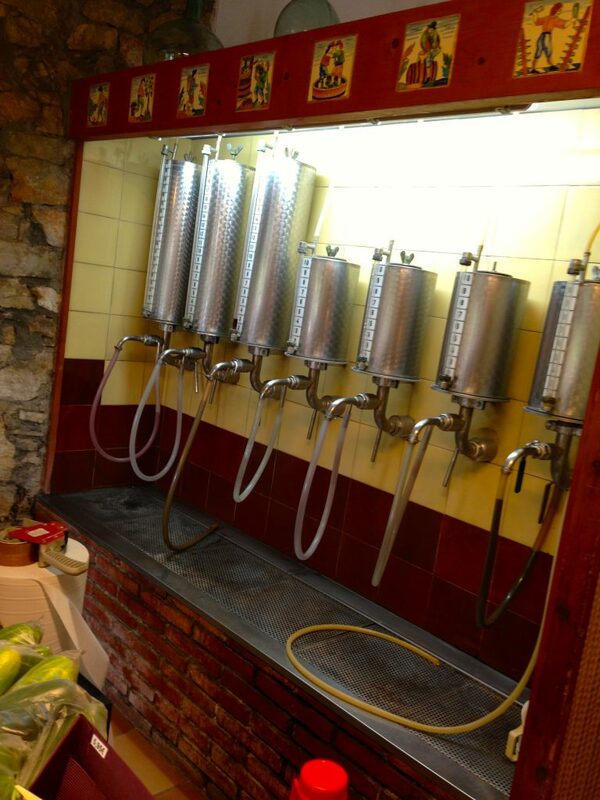 Feel like I was right there with you…loving the options of places in Spain! 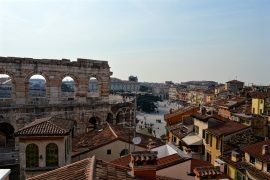 Thank you for linking up with me for Travel Tuesdays! Good to see you enjoyed yourself. It’s a wonderfully unique region in Priorat, so far away from the hustle and well, sometimes the ugliness of the overdeveloped coast. Also nice to see you didn’t stumble upon some of our favorite hidden gems in Priorat. Those will continue to remain a secret 😉 But, the tapas are less of a “thing” in Priorat as they are originally Basque and they’ve been adopted a bit artificially in the last decade or so due to tourists asking for them. As an alternative, if you ever make it back around there, make sure to partake in vermut (a tapas-like pre-meal, but with vermouth) as well as as the “peasants breakfast” (‘esmorzar dels pagesos’) which the rural Catalan areas of Priorat do very nicely. As Cambrils is a bit of a haul and very congested during summer, we might recommend that if you want to have a bite by the water to check out the absolutely stunning Miravet and its castle alongside the Ebre River just a bit southwest of Priorat proper. Calm, tranquil, water, and very authentic, even in summer. wow – sounds amazing! i’ll have to be in touch before we head back! Loved the area, the wines, the food, and the people. 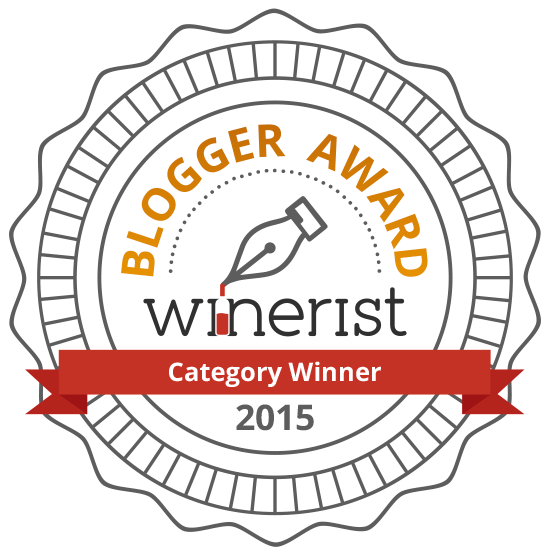 Next week i’m off to Rioja for a wine bloggers conference. looking forward to experiencing another amazing spanish wine country! thanks for reading!